Koch Brothers refers to Charles G. Koch and his brother David H. Koch, the billionaire co-owners of Koch Industries, one of the largest privately-held companies in the world. The New Yorker has described David Koch and his brother Charles Koch as "longtime libertarians who believe in drastically lower personal and corporate taxes, minimal social services for the needy, and much less oversight of industry—especially environmental regulation." The Kochs have built and bankrolled a powerful network of foundations, think tanks, and politically active organizations that try to influence elections and policy. In the 2012 election cycle, the Kochs and fellow donors backed a "network of politically active nonprofit groups" that was "carefully constructed with extensive legal barriers to shield its donors," raising over $400 million for the election cycle, according to the Washington Post. As the Post explains, a "labyrinth of tax-exempt groups and limited-liability companies help[ed] mask the sources of the money, much of which went to voter mobilization and television ads attacking President Obama and congressional Democrats." The Koch brothers spent a total of $220 million on the 2014 midterm elections through their right-wing political advocacy groups: Americans for Prosperity and Freedom Partners. Together the Koch brothers were worth an estimated $102.4 billion as of May 2017. 1.2 "The Koch Brothers Are Killing Public Transit Projects Around the Country"
The Koch brothers played a pivotal role in the "covert campaign" to support President Trump's plan to "allow cars to emit more pollution," according to Dec. 2018 article in the New York Times. Marathon Petroleum "teamed up" with the American Legislative Exchange Council (ALEC), a Koch backed group. The Koch's are also a corporate sponsor of a bill "to repeal the corporate average fuel economy standards.” The times article also points to the Koch's support of the Heritage Foundation as part of the plan to reduce combat car efficiency regulations. "The Koch Brothers Are Killing Public Transit Projects Around the Country"
According to The New York Times via Americans for Prosperity (AFP), the Koch Brothers are "killing public transit projects around the country." Using data from i360 AFP activists are going to door in various cities urging their fellow citizens to oppose public transport plans. "The Kochs’ opposition to transit spending stems from their longstanding free-market, libertarian philosophy. It also dovetails with their financial interests, which benefit from automobiles and highways," The New York Times reported in June of 2018. 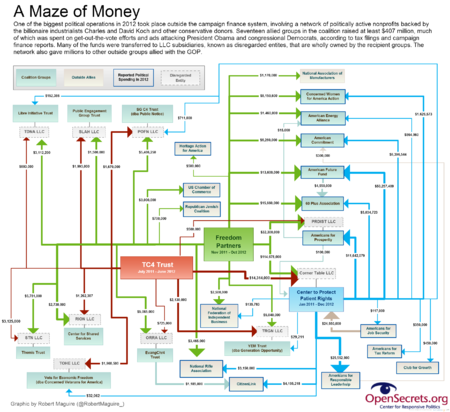 The $400 million Koch network uses a maze of nonprofit groups and LLCs to conceal donations and campaign activity Source: Robert Maguire with the Center for Responsive Politics. Matea Gold and Cristina Rivero/The Washington Post. The Koch brothers political network will spend between $300 and $400 million during the 2018 election cycle. "The funds will be spread across a constellation of groups, including Americans for Prosperity and Freedom Partners Action Fund, along with Concerned Veterans for America, the Libre Initiative and Generation Opportunity, which now operate under the AFP banner," the Washington Post reported. The Koch brothers set a spending goal of $889 million for the 2016 election cycle. In 2015, the Kochs spent $400 million, according to The Hill. However, following the election, the Koch network reported spending $250 million in the 2016 election. Not only do these numbers not add up, it is unclear if these numbers include the money to i360, the money given through KochPAC, or the money given personally by the Koch brothers to candidates or campaigns directly. The Koch-tied American Future Fund took out TV ads in New Hampshire against 2016 Republican Presidential Nominee John Kasich prior to the primary held on February 9, 2015. In the ad, the group attacks Kasich's record for not being conservative enough, "John Kasich — not a conservative. Not even a moderate. An Obama Republican." Nick Ryan, the current president of American Future Fund told The New York Times in an email that the group was running the ads because Kasich was "misleading New Hampshire voters" and that the “The real John Kasich record looks like something you might expect from a liberal politician like Barack Obama." Kasich finished second in the New Hampshire primary to Donald Trump. American Future Fund, a Koch-funded entity located in Iowa, has taken out $1.5 million in ads against Cruz in South Carolina following the group's campaign ads against him in Iowa. The TV ad criticizes Cruz for being "weak" on national security and for supporting a legal status for undocumented migrants in the US. The narrator in the ad states that, “Cruz proposed mass legalization of illegal immigrants. He even praised the traitor Edward Snowden. Ted Cruz’s talk is cheap. His national security record is weak." Through their Americans for Prosperity group, the Koch brothers ran more than 34,000 television ads in the 2014 election cycle. They also operated a network of workers on the ground in 35 states to mobilize voters to advance their political agenda. In the 2012 Election cycle, which President Obama was up for reelection and the democrat's majority in the Senate was challenged, the Koch brothers spent almost $400 million to advance their interests. Read the documents from the 1997 Senate Judiciary Committee investigation of "Illegal or Improper Activities in Connection With 1996 Federal Election Campaigns;" Triad is primarily discussed in Volumes 3-5. The Kochs' funding founded Citizens for a Sound Economy (CSE) in 1984, headed by Richard Fink. Fink was shortly thereafter appointed to President Ronald Reagan's "Commission on Privatization." In the late 1980s and 1990s, CSE pushed for banking deregulation, like the elimination of Glass Steagall, spearheaded the defeat of a greenhouse gas tax, and helped in the defeat of health care reform in the Clinton era. Access a list of organizations with ties to the Koch brothers here. See the related articles below for more information on the Kochs. Nick Surgey, Revealed: Extensive Koch Links to New Right-Wing $250 Million Mega Fund, PRWatch, September 16, 2013. Brendan Fischer, California Elections Board Peels Back Layer of Dark Money Onion, Finds More Onion, PRWatch, November 6, 2012. Lisa Graves, ALEC Exposed: The Koch Connection, PRWatch, July 20, 2011. Theda Skocpol and Alexander Hertel-Fernandez, THE KOCH EFFECT: The Impact of a Cadre-Led Network on American Politics, Prepared for presentation at the Inequality Mini-Conference, Southern Political Science Association San Juan, Puerto Rico", January 8, 2016. 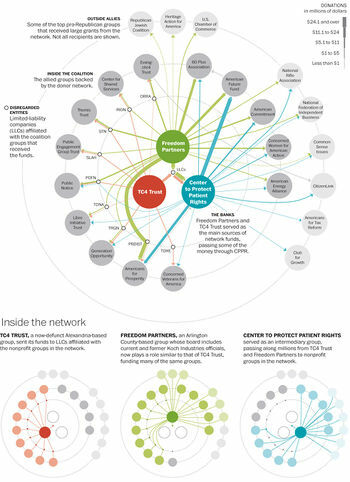 Theda Skocpol, Making Sense of the Koch Network, Scholar Strategy Network, October 2015. Bernie Sanders, What Do the Koch Brothers Really Want?, Common Dreams, April 11, 2014. Mike Allen and Jim Vandehei, Exclusive: The Koch brothers' secret bank, Politico, September 11, 2013. Eric Lach, Revealed: The Secret Koch Group That Gave Conservatives $236 Million In 2012, Talking Points Memo "TPM Muckracker," September 12, 2013. Kenneth P. Vogel, Koch World reboots, Politico, February 20, 2013. Kenneth P. Vogel and Tarini Parti, Inside Koch world, Politico, June 15, 2012. Asjylyn Loder and David Evans, Koch Brothers Flout Law Getting Richer With Secret Iran Sales, Bloomberg, October 3, 2011. Tony Carrk, The Koch Brothers: What You Need to Know About the Financiers of the Radical Right, Center for American Progress, April 2011. Jason Easley, Getting Rich Off The Poor: How The Koch Brothers Wealth Grew 43% Since 2010, PoliticusUSA, September 21, 2011. Brad Johnson, Forbes: Koch Brothers Now Worth $50 Billion, TruthOut, September 22, 2011. ↑ 2.0 2.1 2.2 2.3 2.4 2.5 Jane Mayer, "Covert Operations," New Yorker, August 30, 2010. Accessed July 2, 2014. ↑ 3.0 3.1 Matea Gold, "Koch-backed political network, built to shield donors, raised $400 million in 2012 elections," Washington Post, January 5, 2013. Accessed June 30, 2014. ↑ Rebecca Ballhaus, Koch Brothers Nonprofits’ Spending Surged in 2014, Wall Street Journal, November 18, 2015. ↑ Lianna Brinded, The 33 richest people on earth, Business Insider, May 7, 2017. ↑ 14.0 14.1 14.2 14.3 Stacy Singer, David Koch intends to cure cancer in his lifetime and remake American politics, Palm Beach Post, February 18, 2012. ↑ 15.0 15.1 15.2 James Hohmann and Matea Gold, Koch network to spend $300 million to $400 million on politics, policy in 2018 cycle, Washington Post, January 28, 2017. ↑ 16.0 16.1 Nicholas Confessore, Koch Brothers’ Budget of $889 Million for 2016 Is on Par With Both Parties’ Spending, New York Times, January 26, 2015. ↑ Jonathan Swan, Koch brothers network ready to oppose Trump, The Hill, February 1, 2016. ↑ 18.0 18.1 Cindy Zuvich, Koch-linked group blasts Kasich in ad buy, The Center for Public Integrity, January 28, 2016. ↑ Alexander Burns, John Kasich Is Called an ‘Obama Republican’ in New Hampshire Ads, The New York Times, January 27, 2016. ↑ The Washington Post, New Hampshire primary election results, The Washington Post, 2016. ↑ Alex Altman, Cruz Takes Fire on South Carolina Airwaves, Time, February 12, 2016. ↑ 22.0 22.1 Nick Gass, Cruz campaign asks stations to stop airing anti-Cruz ad, Politico, February 16, 2016. ↑ 23.0 23.1 Peter Overby, This Political Ad Was Paid For By — Oh, Never Mind, NPR, October 22, 2014. ↑ 25.0 25.1 Daniel McCoy, "Charles Koch: business giant, bogeyman, benefactor and elusive (until now) -- exclusive interview," Wichita Business Journal, February 28, 2014. Accessed June 2, 2014. ↑ 31.0 31.1 31.2 31.3 31.4 31.5 Lisa Graves, "The Koch Cartel: Their Reach, Their Reactionary Agenda, and Their Record," The Progressive, July/August 2014. ↑ 36.0 36.1 36.2 36.3 Lisa Graves, "ALEC Exposed: The Koch Connection," The Nation, July 2012, 2011. Accessed June 2, 2014. ↑ 39.0 39.1 Daniel Schulman, Sons of Wichita: How the Koch Brothers Became America's Most Powerful and Private Dynasty, Grand Central Publishing, 2014. ↑ 43.0 43.1 43.2 43.3 43.4 43.5 43.6 43.7 43.8 43.9 Nicholas Confessore, "Quixotic ’80 Campaign Gave Birth to Kochs’ Powerful Network," New York Times, May 17, 2014. Accessed May 29, 2014. This page was last edited on 14 December 2018, at 20:10.